At least Posh defender Gaby Zakuani had something to celebrate against Bury. Photo: Joe Dent/theposh.com. 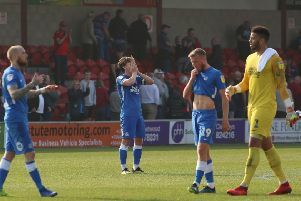 Marcus Maddison and Gaby Zakuani were the star performers for Peterborough United as they went down 3-2 to in-form Bury at the ABAX Stadium tonight (September 29). But generally the Posh players were second-best against a very slick visiting side. Conor Washington: (for Angol, 66 mins).